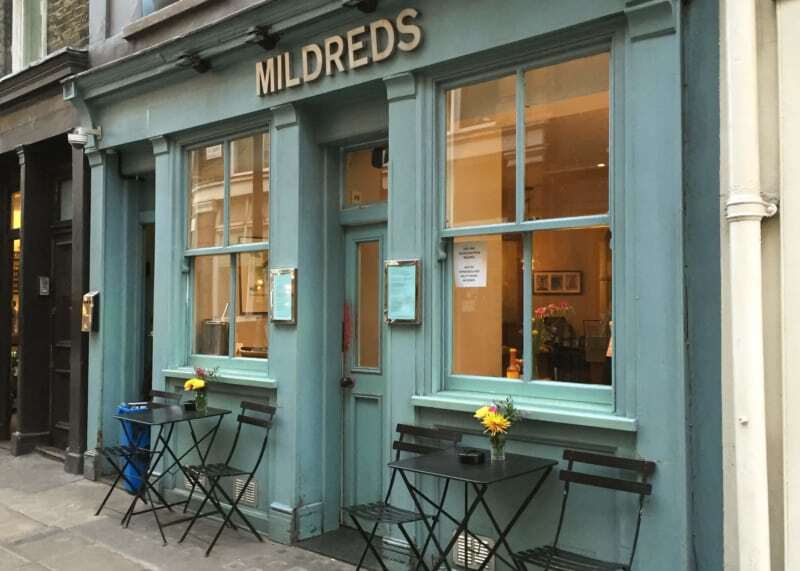 Mildreds Soho is one of the oldest and most well-known vegetarian restaurants in London, popular with locals and tourists alike. Soho has been home to many great vegetarian and vegan places. Sadly, as rents have risen, a number have closed or moved on. Mildreds, however, seems to defy all odds, having been fixed to the neighbourhood for nearly 30 years. The restaurant is housed in an 18th-century townhouse on Lexington Street: a small building, but one filled with character. The owners have always had a ‘no bookings’ policy, which means a healthy crowd inside and out. Tables, mostly set for two, are placed closely together. With a bar at the front (the best place to bide your time before being seated), the narrow space is lively and full of chatter, but not uncomfortable or too loud. 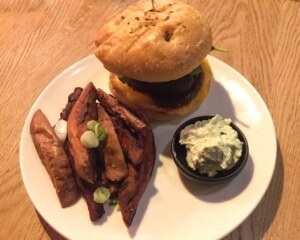 The daily specials chalkboard has been replaced in a recent refurbishment, but the menu continues to offer reliable, hearty mains like a mushroom and ale pie, Sri Lankan sweet potato and green bean curry, and smoked tofu burger. 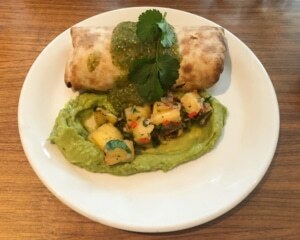 Most of the dishes are vegan or a vegan option is offered. The starters take inspiration from different cuisines; you’ll find small plates such as gyoza dumplings, pan-fried manouri cheese, artichoke crostini and pizzetta. There are also ‘superfood’ salads, and plenty of sides and desserts to choose from. A few options on the menu change seasonally. The bar serves organic wines, beers and ciders alongside cocktails and mocktails. Most alcoholic drinks are suitable for vegans. There are fresh juices and soft drinks as well. At lunchtime, a takeaway bar offers salads, soups and quiches. Mildreds is often said to be as popular with those who aren’t vegetarian or vegan as those who are, and it shows at the door. It’s always warm and friendly, with a busy cafe ambiance. The owners are now applying their winning formula elsewhere: a second Mildreds opened in Camden, and a third in King’s Cross.